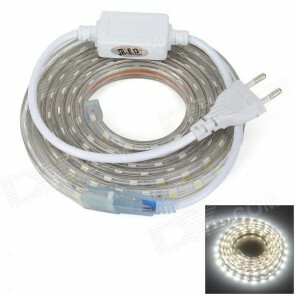 White 120 Volt High Output LED SMD5050 16 feet Flexible Flat LED Strip Rope Light Christmas Lighting, Indoor / Outdoor rope lighting, Ceiling Light, kitchen Lighting] [Dimmable Ready to use 7/16 Inch Width X 5/16 Inch Thickness. With bright LED chips mounted on a printed circuit board, enclosed by premium grade PVC, our 120v LED SMD strip light offers unparalleled stability and durability. It is popular in many residential and commercial lighting projects, from crown molding accent lighting, to building perimeter highlighting; from kitchen cabinet under lighting to sign displaying. Effect is exceptional, and result is impressive. With its flexibility and versatility, plus a wide range of accessories, we offer a simple solution for your lighting decoration project.